Well, it's final -- POLAR EXPRESS is my new favorite holiday movie (so far this year, I've seen it twice)! Last night while it was on, I was inspired to do a train card, but what to do about a train image? And then it came to me -- "I've got the Circus Train set from SU!!" I turned on the TV in the craft room to my favorite movie, got down the train stamp set and started in. First of all I had all those circus animals that were on board the train to deal with (they just did not go with the Christmas theme). I stamped the images and sprayed stamp cleaner on a Q-tip and wiped off the ink for the tiger, giraffs, and moneys. 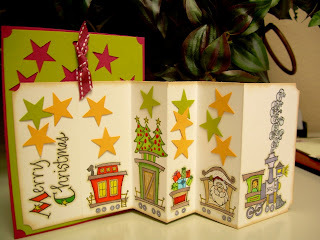 Then I stamped the images on the white card stock leaving spaces in between the cars for the mountain/valley folds (as described in http://notimetostamp.blogs.splitcoaststampers.com/ (Sharon Johnson's post about her accordian card) and my daughter Susan's blog (http://www.susiestampsalot.blogspot.com/) . Then I got down the various other images from SU and Whipper Snapper and put them aboard the train via masking and colored them, too. I decorated the panels with stars that were punched out with the SU punch. I mounted the last panel onto the front of the card with heavy duty double sided tape. Thank you for visiting my site and hope you'll come back soon ..... I should be posting again soon as I have been neglecting it for a while. this is AWESOME!! i love love love it!! i want to see it in person! I LOVE this card! Totally fabulous! Great job! That is really cute! I love the snowman. Lots of coloring! Great job! And the photogtaph looks GREAT MOM!!!! HOORAY! You don't know me, but I frequent your blog and I love your train card! It is darling! Keep up the good work!